SANTO DOMINGO, Dominican Republic (AP) — A long-time governing party official took the lead late Sunday in vote counting from the Dominican Republic's presidential election, leading a brash ex-president whose last term ended with the deepest economic crisis in the country's modern history. 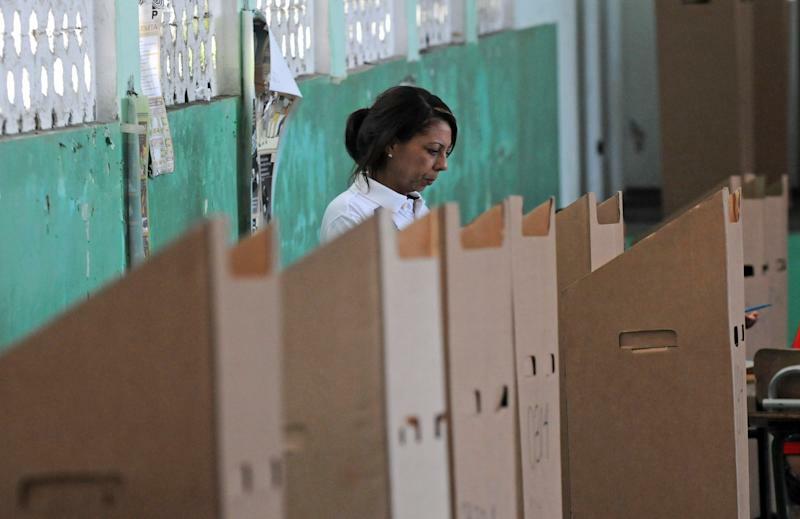 With 60 percent of the vote counted, Danilo Medina of the ruling Dominican Liberation Party led with 51 percent, while former President Hipolito Mejia and his Dominican Revolutionary Party had nearly 47 percent. The winner needed more than 50 percent to avoid a runoff. Mejia's representative on the Electoral Commission accused the ruling party of fraud, saying the former president should have received many more votes than what was being reflected in the results. "We all know what party the director of the Electoral Commission belongs to," he said at a news conference. Voting appeared smooth, though several people told The Associated Press that backers of Medina were offering people payments of about $15 to vote for their candidate or to turn over their voting cards and withhold their vote for his opponent. Medina campaign organizers denied the allegations, which have circulated in the country for weeks. Francisco Alvarez, coordinating the 3,000 observers of the civic group Citizen Participation, said many reports had come in from around the country of vote-buying by local workers for both parties. Medina hoped to succeed President Leonel Fernandez, who spent $2.6 billion on such major infrastructure projects as a subway system, hospitals and roads to modernize a country that is the top tourist destination in the Caribbean but remains largely poor. Many voters conceded that Medina, a 60-year-old stalwart of the Dominican Liberation Party, wasn't a particularly exciting candidate, but said they were eager for a stability in a country with a history of economic and political turmoil. "I don't want major change," said Amauris Chang, a 59-year-old shop owner. "I want the country to grow and I want it to be peaceful, and I think that's a common idea among people who are civilized." Six candidates were running for president, but Medina's only real opponent was Mejia, who lost his bid for a second presidential term in 2004 because of a deep economic crisis sparked by the collapse of three banks. Mejia, a garrulous populist, and his Dominican Revolutionary Party have a devoted following. His supporters sought to portray some of the public works spending as wasteful and benefiting backers of the president, and insisted he wasn't to blame for the 2004 economic crisis. "The crisis could have happened to any government. It had nothing to do with Hipolito Mejia," said 62-year-old maintenance man Alonso Calcano. Rosario Espinal, a leading political analyst for the Dominican Republic, said the outcome would largely depend on swing voters who aren't committed to either major party. She said there was a lot of disenchantment with the government, particularly because of the high cost of living and lack of good jobs, but it was not clear whether that was enough to overcome memories of the crisis at the end of Mejia's term. "The question is whether they are more tired of the current government or more fearful of what might happen under Mejia," said Espinal, director of the Latin American Studies Center at Temple University in Philadelphia. 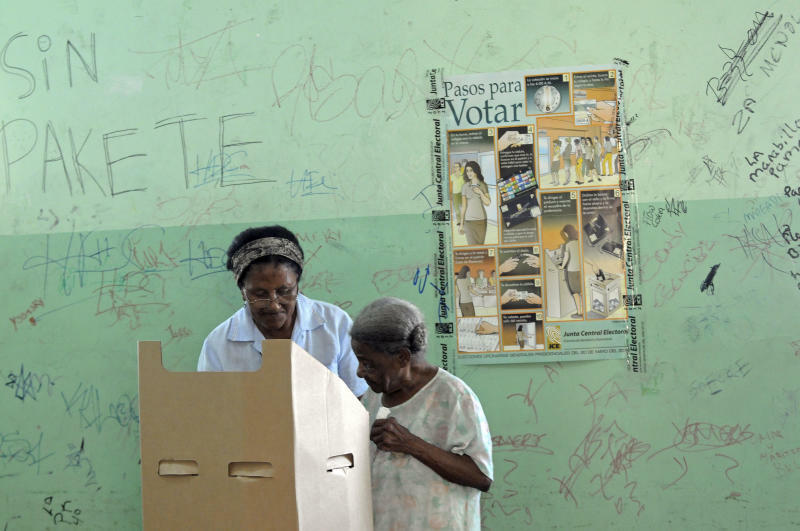 Besides president, Dominicans were electing a vice president from a field that included the heavily favored first lady, Margarita Cedeno de Fernandez, and seven members of the Chamber of Deputies who will represent people who have settled overseas. 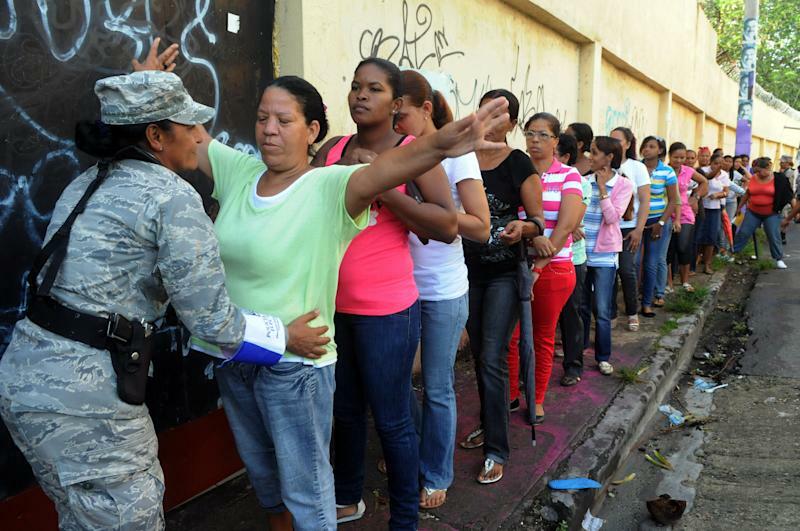 Tens of thousands were expected to cast ballots in places with large numbers of Dominicans, including New York, New Jersey, Florida and Puerto Rico. Both presidential candidates proposed to increase spending on education and to do what they can to create jobs in a country of 10 million people that is largely dependent on tourism and where unemployment is officially about 14 percent, though the vast majority of workers are in the poorly paid informal sector. The typical salary for those who do have regular jobs is around $260 a month. Mejia, a 71-year-old who refers to himself as "Papa" and styles himself as a man of the people, enlivened the campaign with some of the verbal missteps for which he has long been famous. Most recently, he joked that house maids are prone to steal meat from the houses where they work so they can give it to their boyfriends, not a wise comment in a country where more than half the population works in the informal section, many of them as maids. Mejia "talks a lot of nonsense," said Maria Altagracia Ramirez, a 26-year-old maid. "How could I vote for him? That man is crazy."